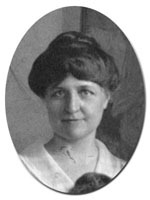 Clara Sykes was thesecretary for the Home Economics Department in 1918. She brought considerable experience to the position. Sykes graduated in l901 from Northbridge High School in Whitinsville, Massachusetts. She earned a B.A. from Wesleyan University in 1905. In 1912, she also received a B.S. from Simmons College. Before coming to Cornell she had numerous experiences in public education: as a high school teacher, assistant principal, registrar, and inspector in charge of examination and teacher certification for the Connecticut State Board of Education. She remained at Cornell for just one year.